Gluten-Free Coconut Lime Drizzle Cake is one of my favourite cakes, beautifully moist and zesty with a crunchy frosted adornment. It’s not that I had forgotten how hard it is with a newborn, just conveniently misplaced the memory as I concentrated on the trials of pregnancy and getting our new life here safely into our family. Pretty much just like Cole was when he was first born, Beau doesn’t want to be put down. When he’s not feeding in my arms he likes a nice comfy snooze in my arms or maybe snuggled in a ball as he rests against my chest with his little head nestled between his tiny arms. He can mix it up. That goes for daytime, nighttime, mealtimes, loo breaks, dog walks. The buggy is a no no and if he’s placed into it for five seconds or more then it’s as if his whole world is crashing down. This is completely different to Cole as he loved the gentle movement of the buggy and it was the only time I could get a reprieve if I took us for a walk. So I’m slinging it, which is great for giving me both hands to make toast, boil the kettle, do some household chores and get the bus into Crouch End whilst holding Cole’s hand but the sleep deprivation is making me wacky. As such my carb and sugar intake has risen sharply to keep my eyes open and my brain a little less blurry. A homemade cake is pure loving indulgence and thank goodness I put one of these Coconut Lime Drizzle Cakes into the freezer when I was pregnant as it’s an absolute godsend at 3am. Which is also when I’m writing this post by the way. Baby against my chest, cake in one hand, keyboard in the other. When I put it like that, it actually sounds quite appealing. Loaf Cakes do hold a special place in my heart. There a few things more comforting and homely than a thick slice of moist sponge, bursting with deep fresh flavour, washed down with a cup of strong tea. It’s pretty much why I bake. I have been making this Coconut Lime Drizzle Cake for a few years now, for the cake stall and for my family and every time I serve it up anew I surprise myself with how much I adore it. I have been asked countless times when it’s going to feature on the blog and to be quite honest I had completely forgotten that it hadn’t already made an appearance as this cake is so ingrained in my life. But it hadn’t, so here it is. Coconut Lime Drizzle Cake is actually a perfect spring cake, bridging the gap between wintry citrus flavours and the brightness of the coming months. The sponge is super coconutty with a slight chew from the desiccated coconut but also ultra citrusy from the lime zest and juice. The gluten-free element is also easy to navigate with no hard to purchase flours, just a simple gluten-free plain flour of your choice (I used Doves Farm) and homemade almond paste, which is no big deal as it takes a couple of minutes to whizz up in the food processor. 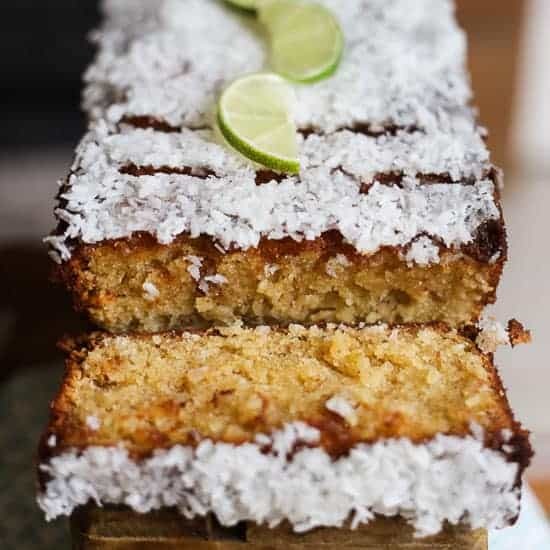 Warm out of the oven the cake is frosted with a crunchy coconut and lime drizzle and an optional adornment of fresh lime slices. It’s the perfect excuse to be up at 3am, that and a two-week old baby. Gluten-Free Coconut Lime Drizzle Cake is one of my favourites, beautifully moist and zesty with a crunchy frosted adornment. Line and grease a 9 inch loaf tin and pre-heat oven to 160°C on the fan setting*. Mix the caster sugar with the lime zest until fragrant. Beat the butter into the sugar until light and creamy. In a food processor make the almond paste by whizzing up the almonds with the caster sugar until they resemble fine breadcrumbs, then add the golden syrup, vanilla extract, lime juice and egg white and whizz again until well combined. Add the almond paste to the creamed butter and sugar and mix together. In a separate bowl whisk together the gluten-free flour, desiccated coconut, baking powder and salt then add to the rest of the batter. Beat well until fully combined. Pour into the prepared baking tin and bake for 60 minutes or until an inserted cocktail stick comes out clean. Remove from the oven and leave to cool slightly in the tin whilst you prepare the drizzle. Mix the lime juice, coconut and granulated sugar together. Turn the cake out of the tin and turn the right way up. Poke holes all over the surface using a cocktail stick, then pour the drizzle over. Cool completely before serving, slicing a fresh lime to decorate the top of the cake. *I find that due to the moistness of this cake that the fan setting helps set the cake a bit better. However, if you don’t have a fan setting on your oven then 180°C is fine for a conventional oven but do check after half an hour to make sure the top of the cake isn’t browning too much. If it is, then pop a piece of loose foil over the top of the cake. is my absolute favourite. It’s just a great size, slightly bigger than your average 2lb loaf tin so bear in mind for some recipes. It is made of anodised aluminium so conducts heat brilliantly, making the cake bake evenly all the way through. It’s really hard wearing and pretty much completely non-stick but has no coating. However because of the anodised aluminium you mustn’t put it in the dishwasher or it will ruin.